These spammers are sending to email addresses they have guessed by parsing my website. Identify general principles under the Fair Labor Standards Act. 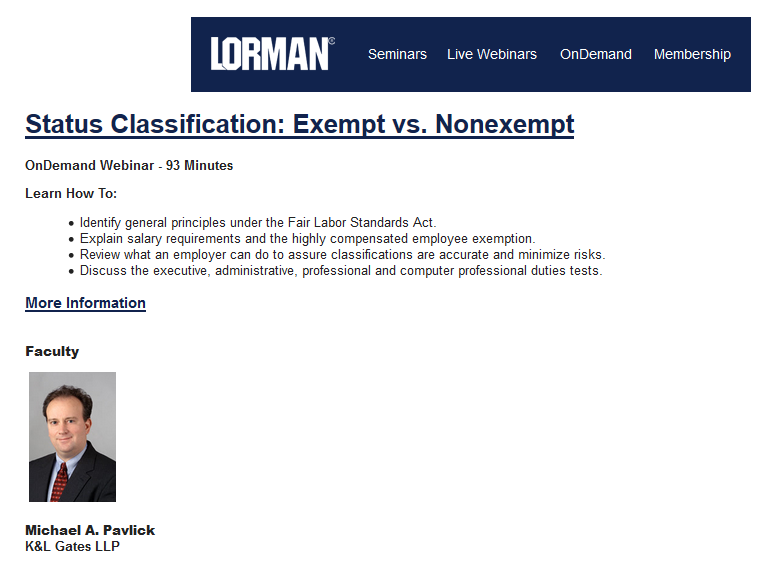 Explain salary requirements and the highly compensated employee exemption. Review what an employer can do to assure classifications are accurate and minimize risks. Discuss the executive, administrative, professional and computer professional duties tests. The link in the email goes to lormaneducation.net and then forwards immediately to lorman.com, which is a typical technique that spammers use to try to avoid getting blacklisted. Admin Organization: Lorman Education Group, Inc.
Spam originates from 184.175.164.1 (US Signal) in a range suballocated to Lorman that you might want to block traffic from of 184.175.164.0/26. If this company thinks that promoting its seminars through spam is a legitimate way of promoting a business then I would personally give their "seminars" a very wide berth. Before you consider taking down this post at Loman's request, you should know that this comment by Ben Halverson is total BS. They still spam people without asking, and they still don't have a removal link in their emails. I received something like 2 emails a day for two weeks, as recently as this month. FYI, Still spamming, using a different email domain each time. Thank you for posting the list of domains. For Mr. Halverson: If you didn't want to "offend users like this" then why do you have so many domains? I started receiving spam emails from this group about two weeks ago. I do not know how they got my email address. Sometimes I get 4-5 emails a day. It is VERY annoying. they are stil spamming me on my work email. it is September 2016. They are still spamming as of December 2016. In July 2016, they obtained my business email somehow and have been spamming it 3-11 times a month, sometimes several times a day. Just received SIX emails and some earlier today using various email names @mydomain. My Catchall email catches all of them. Also, their unsubscribe DOES NOT WORK! I keep spamming and they keep coming. My webhosting company is not filtering them by THEIR domain, which the should. They spam me all the time. I'm plugging away blocking their addresses one by one, but it's a pain. They are continuing with their spamming. 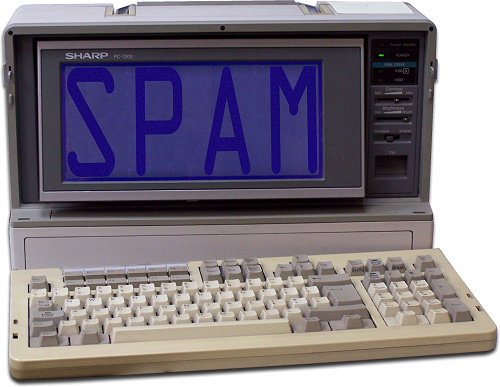 they started hitting my works email with spam now too so i cannot do much but delete it. I am going to start broadcasting their various emails on public sites so the spam bots pick them up. Sinister spam from "Agent Feather"